PAYE Modernisation allows for PAYE reporting to be submitted to Revenue in real time. On 1 January 2019, the Irish PAYE system was modernised and updated. This new system is known as PAYE Modernisation and allows for PAYE reporting to be submitted to Revenue in real time. PAYE Modernisation or real time reporting (RTR) enables Revenue to ensure that employees are receiving their correct tax credits and cut-off points throughout the year. This compares with the previous PAYE reporting process which was done through P35s on a yearly basis. PAYE Modernisation came into effect on 1 January 2019. 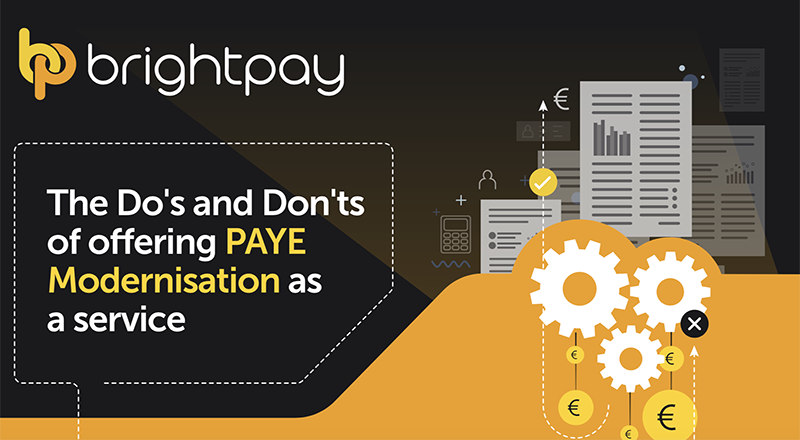 PAYE Modernisation allows for real time communication between employers and Revenue that relates to the pay and tax deductions. By operating in real time, Revenue can ensure that the correct tax deduction is being made at the right time for every employee. Employees also have online access to payroll information submitted to Revenue by their employer in real time. Going forward, employers are required to submit payroll information to Revenue every pay period. This will ensure that Revenue have accurate information for employees at all times. This process is made easier when completed through payroll software. The introduction of PAYE Modernisation improves the accuracy and transparency of the PAYE system between employers, employees and Revenue. This real time reporting process also means that the correct tax is deducted when an employee is paid, reducing the occurrence of an employee overpaying or underpaying tax. Payroll software that is fully integrated with Revenue for PAYE Modernisation allows employers to simplify the payroll process and significantly reduce the administrative cost. Submitting payroll information in real time removes the need for employers to create P30, P35, P45, P46 and P60 forms which further reduces administrative processing. There is a significant administrative burden placed on small employers who process their payroll manually. Revenue have stated that they are committed to providing a workable solution for smaller employers who may not use payroll software and employers who have difficulty accessing a broadband connection. However, Revenue advise that these employers utilise payroll software that caters for and simplifies the PAYE Modernisation process. Fortunately, there are cost effective solutions, such as BrightPay that offer easy to use payroll packages with unlimited employees, free support and full PAYE Modernisation functionality. By using payroll software, employers will save time by streamlining their payroll processing and real time reporting. Continuing with a manual process could lead to errors and increase the risk of non-compliance. It would also be very time consuming to continue with a manual process. 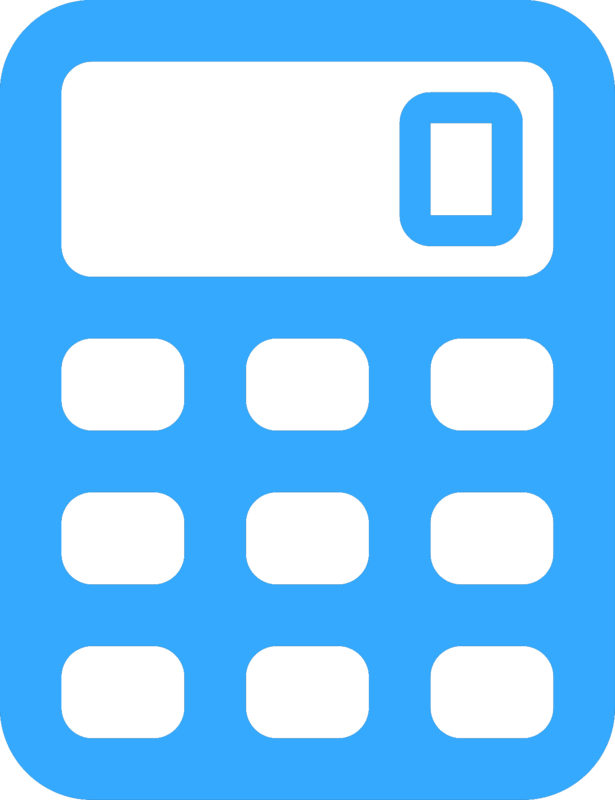 Click here to calculate savings with BrightPay. 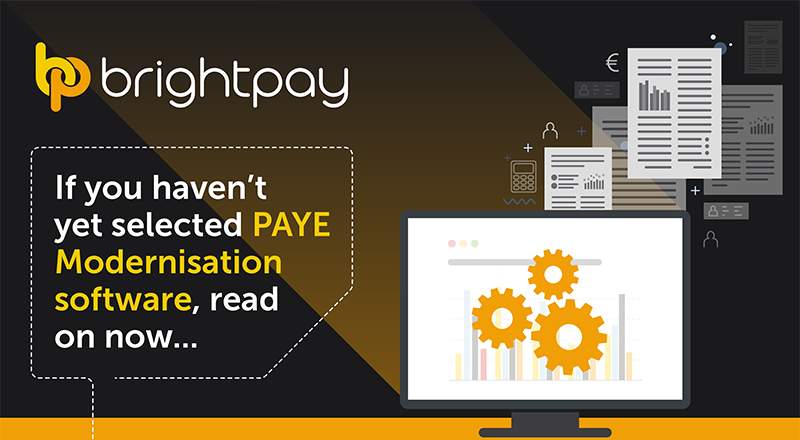 BrightPay has worked and will continue to work with Revenue to make sure our payroll software easily caters for the needs of PAYE Modernisation. BrightPay won Payroll Software of the Year 2018 at the Accounting Excellence awards. Our software streamlines real time reporting for employers to easily comply with PAYE Modernisation. Read: PAYE Modernisation checklist to ensure 100% compliance. 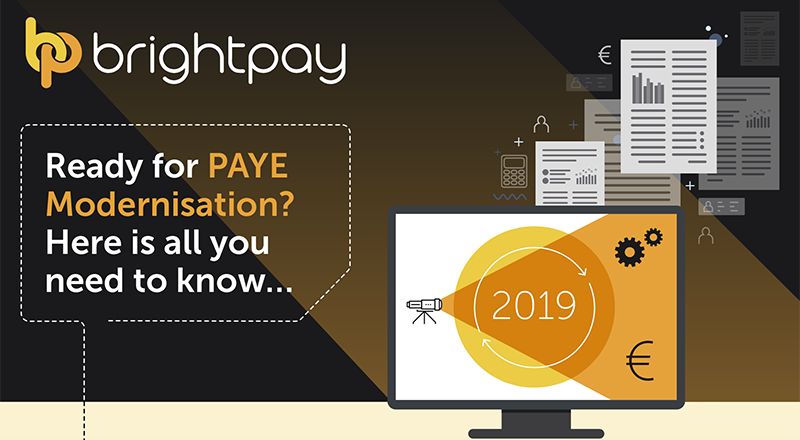 Click here to book a demo of PAYE Modernisation with BrightPay.